Here is a very useful addition to our range of aluminum transporters – the Air Pallet Transporter. These air pallets are particularly suitable for use as warehouse equipment or in other similar type facilities. Air Pallets are ideal solutions to handle loads of standards shapes and sizes. The push handle assembly installed at the rear of air pallets provides greater operational control to handlers. The push assembly also includes a set of handlebars for better grip, a switch to trigger operations, an air inlet to monitor and control air supply, a balancing valve to guarantee sufficient air supply to different bearings sustaining different weighing loads and a mechanism to gauge the air supply available for the air pallet to operate. Air pallets can easily sustain and mobilize loads weighing 500 pounds to 20 tons. They can be customized according to different specifications and needs. The width of these pallets starts from 3 ft and changes can be also be made to the footprint size to cover greater distances. This product is specially recommended to clients who need to hold the weight, instead of directly loading it on the air pallet. 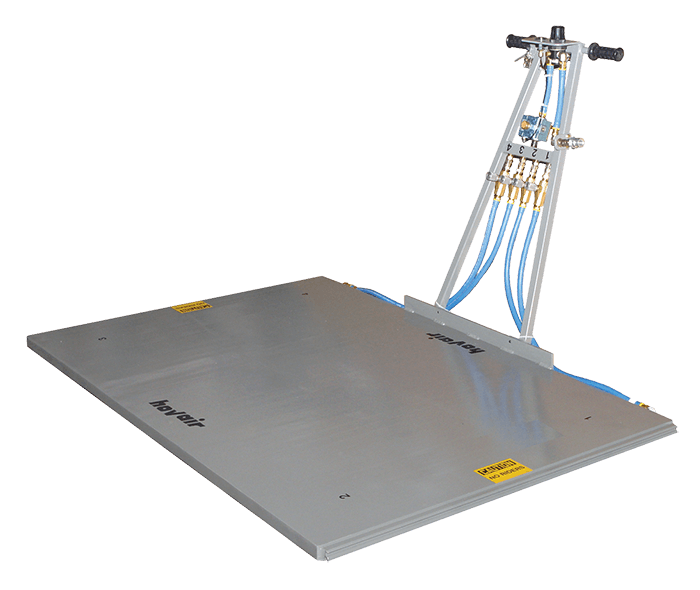 This machine facilitates repeat movement of same-sized heavy objects within a warehouse or factory. It reduces the time and resources required to move warehouse equipment. All you need to do is simply lift the load, place it on the air pallet, activate the air supply and float the load to the desired location. Note: Due to the location of the push handle assembly, it is not advisable to carry loads that require an overhang of the air pallet. Overhangs are not usually recommended, but where there are no alternatives we would recommend checking out our regular Aluminum Transporters.